Celebrate your memorable wedding in this spectacular outdoor area, with the suggestive view of the lagoon and beach area to one side and the yachts resting in their berths to the other. 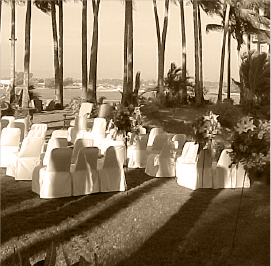 In this area you can have the civil ceremony and the banquet or reception. Surrounded by colorful tropical flowers and a superbly well maintained lawn, this is one of the most private outdoor areas in the resort for your wedding and reception. This area has easy access through the Foyer. The Espigon divides the Grand Isla Navidad Resort from the Mesón Doña Paz and has lush palm trees and manicured grass creating an incredible natural setting. It is one of the most used locations for wedding ceremonies because it offers the best scenery of the ocean as a backdrop with its golden sunsets, the lagoon and the mountains. Just steps away at the edge of the lagoon, you can have your wedding banquet on the golden sand of our private beach on the lagoon. Undoubtedly one of the most spectacular locations in Isla Navidad. This area offers both a beach location and terraces in a very private setting with all of the facilities to make your wedding a memorable one and here you can party the night away. Complimentary transportation is provided for you and your guests from the hotel. An additional rental fee for this area may apply. Spectacular beach setting on the Pacific Ocean with golden sand and surrounded by cliffs and lush mountains. Located about 15 minutes away from the hotel's lobby and in front of the Golf Course, this very safe haven offers one of the most incredible settings in all of Mexico to make your special occasion an unforgettable experience. Transportation to and from Playa Cocos has to be arranged through a DMC and an additional rental fee for this area may apply. For your civil ceremony and a small reception of up to 40 people, nothing better than this beautiful terrace overlooking the lagoon and the quaint town of Barra de Navidad. Enjoy that significant moment outdoors and under the stars.